Diagnostic Features - Polymorphic. Antennae 12-segmented, inserted some distance behind the posterior clypeal margin. 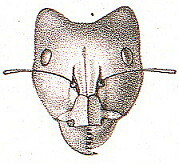 Frontal carinae converging anteriorly, leaving the antennal insertions only partially or not at all covered. Eyes present, usually well developed and situated behind the midlength of the head. Clypeus often with a median portion projecting as a truncated lobe, more obvious in larger workers. Mandibles with five to seven stout teeth. Promesonotal suture distinct, development of other sutures variable. Alitrunk unarmed. Petiole a node or scale, unarmed. Acidopore circular and clearly visible. 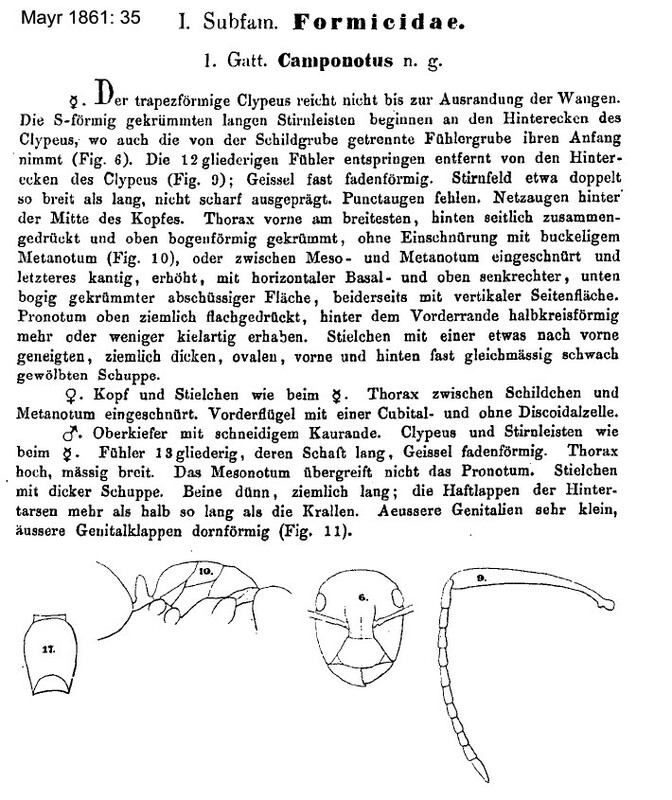 He also reported a single worker from Hamman, 15.iii.1935, which might be a variety of rufoglaucus. 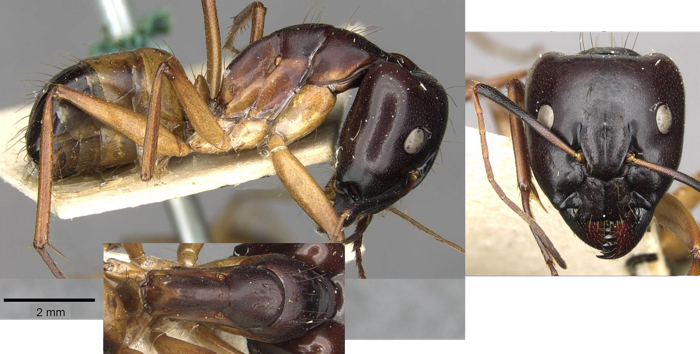 Walker (1871: 170) described Camponotus pilaeogaster; this minor specimen is not obviously any of the better described species and was not listed by Bolton (1995: 117)..
Forel (1912i: 91) - head as in Orthonotomyrmex, major very broad posteriorly, minor trapezoidal, broadened posteriorly; thorax with or without dorsal notch; in major and queen anterior of head covered with deep round pits. Ashmead (1905b: 384) - member species regarded as in Myrmoturba by Wheeler (1922); synonymized by Emery (1925b: 75) - clypeus carinate, with pronounced anterior median lobe (usually rectangular). Head of major usually much wider posteriorly, occiput usually without a border; minor head with parallel sides, sometimes narrowed posteriorly; mandibles usually with 6-7 teeth; thorax dorsum arcuate, rarely with propodeum slightly depressed and saddle-shaped. Usually nesting in ground or under stones (truly global with very many species). -- MAJOR TL 14 mm plus; very variable in colour and size, enormously plastic species (type form in photo). 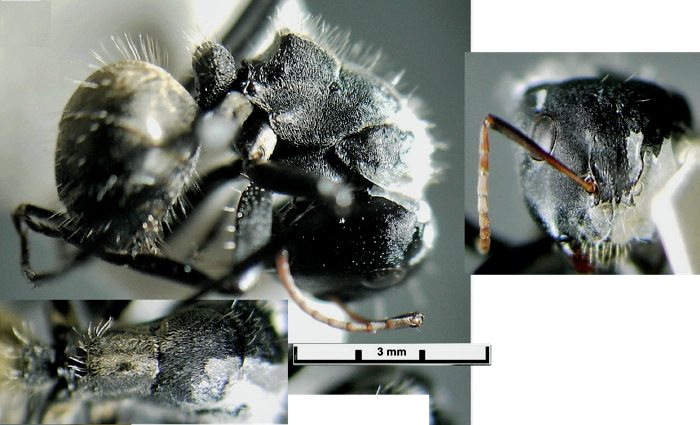 Egypt records - possibly not found as niche filled by C. aegyptiacus; Karavaiev (1911: 10) reported finding major and minor workers and wingless queens from Cairo but he noted the queens had parallel sided heads matching the type queens in Emery (1908a: 192). However, Sharaf list - Abuzabal (Qalyubiya), 13.vi.2003 (2); Abuzabal (Qalyubiya), 14.vi.2003 (1); Abuzabal (Qalyubiya), 14.v.2003 (1) (SHC). Local distribution: Nagh Hammadi, Salloum, Kantara. The link is to the page on Ants of Africa.